Next to the adorable smiling face of a young boy read the words, "Let's wipe out cancer, diabetes and autism in his lifetime." The last item in that tagline -- "autism" -- is what got these Seattle Children's Hospital ads pulled from King County Metro buses last Friday. The Autistic Self Advocacy Network's Washington state chapter (ASAN-WA) organized an online campaign objecting to the ad's juxtaposition of autism with illnesses such as cancer and diabetes. "Autism is a disability, but it is not a disease. It is not a life-threatening illness," said Matt Young, co-leader of ASAN-WA. "The idea it's a state to be wiped out has much negative impact on our lives." ASAN is a leading organization in the neurodiversity movement, which seeks acceptance of autism as a variation in mental function rather than a disorder to be cured. The ad, and the reaction to it, highlight differences in the autism community between neurodiversity advocates who view autism as another way of being and other groups more focused on finding a cure. On Friday, Seattle Children's posted an official statement on its Facebook page: "We are sorry for the hurt and anger these ads have caused -- that was never their intent." In an interview Monday, Katharine Fitzgerald, director of marketing and health promotion at Seattle Children's said: "It's been difficult because we do so much to support children, teens, and families affected by autism here at Seattle Children's, and we're doing amazing research at our research institute." The hospital also has an Autism Center that provides treatment and support for individuals with autism spectrum disorders. 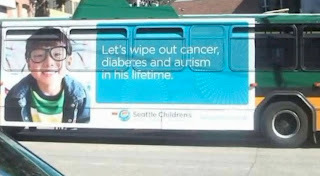 The bus ad was one of three created as part of a $70,000 campaign to raise awareness for Seattle Children's Research Institute. The language of the campaign is meant to reflect the "breadth and depth" of the institute's research arm, according to Fitzgerald. The campaign rolled out on Monday of last week. The ads are expected to be replaced with a new version within the next two weeks. Last Tuesday evening, a member of ASAN-WA brought the ad to Young's attention, and he contacted the hospital to lodge a complaint. Things only picked up, Young said, when he wrote a blog post calling on others, who like him have autism, to post on Seattle Children's Facebook page. "Autistic people such as myself do not need a cure, instead, we need people to accept us for what we are and to celebrate our gifts as well as they would celebrate anyone's," wrote Beth Ann Vosskuhler-Waleski on Facebook, echoing the sentiments of several comments on the page. How to allocate money between finding a potential cure and helping autistic individuals navigate their lives has divided autism advocacy groups. Autism Speaks, one of the biggest national organizations, has been criticized for devoting too much money to research aimed at eventually eliminating autism. "The funding priorities are drastically out of whack," Young said of ASAN-WA. The neurodiversity movement itself, which embraces the different abilities of autistic individuals such as savants, has been criticized for being less inclusive of low-functioning individuals who would most benefit from effective treatment. Arzu Forough, CEO of Washington Autism Alliance & Advocacy, said she wants advocacy organizations to work together. "We try to be a consensus builder, we try to work with all organizations that work with autism," she said. "We try to build coalitions, and we try to steer away from anything that's divisive."